How long does it take for wasps to die after treatment? Jump Menu: How long does it take for wasps to die after treatment? Can honey bees be removed? Can you treat a wasp nest next to a pond? What is the difference between common wasps and German wasps? How can I tell if I have a wasp nest? After the application of a treatment to a nest, we always advise that customers stay away from the nest area for a couple of hours, or until all activity has ceased. In reality, wasps usually die off within 15 minutes after coming in contact with the treatment. The delayed reaction to the insecticide gives them time to carry the dust into the nest interior and spread it around, contaminating the whole nest. 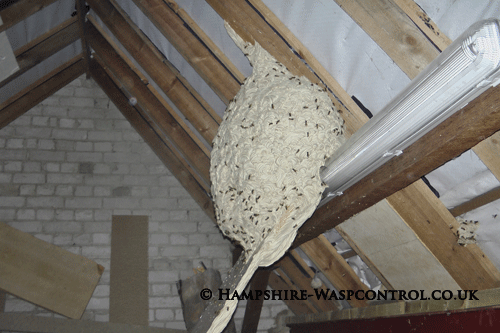 Any foraging wasps will need time to return to the nest to come in contact with the treatment, and this can take a couple of hours for them to all make it back to the nest. A sizeable busy nest might go on for a bit longer. Occasionally one or two wasps will not make it back to the nest until the following morning; if this happens, it is not a failed treatment. These wasps will eventually enter the nest and die. We suggest customers are patient and only call us back if the nest is still active the following day. Can honey bees be removed? Over the last decade, it has become apparent how pesticides have affected our bee population. Most people are now aware of the problems and are keen to avoid killing bees unnecessarily. Bees are not protected, but there are strict guidelines on how pest controllers deal with bees. In some cases, there is no other choice but to kill a colony, but it should be the last course of action. If it has been decided that a colony must go, all access points must be blocked after treatment and when possible the honeycomb removed. The reason for this is bees will take advantage of an unguarded honeycomb with stores of honey, and if the comb is contaminated with a residual insectiside, the bees raiding the comb could take contaminated honey back to their nest/hive and kill their colony. There are new ways of removing bees without the use of insecticide being tried and tested all the time. If you have bees, contact your local beekeeping association and discuss the problem with them. We no longer deal with any bee species. Can you treat a wasp nest next to a pond? If you have a wasp nest near a pond, there will be some considerations to the approach taken. The insecticide that we use must not enter any water sources and is very harmful to aquatic life. We will need to discuss the situation with you and form a plan of how we can treat the nest safely without contaminating the water source. There will be some occasions where this is impossible to achieve, and we will not be able to proceed. What is the difference between common wasps and German wasps? Common wasps are slightly smaller than the German wasps, and these are the ones that you will find nesting in your home (loft/shed) or underground. German (European) wasps build their nests in bushes and hedgerows and are slightly larger than the common wasp. 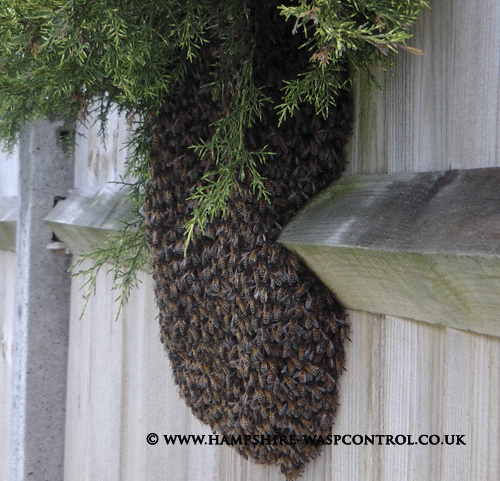 If you have wasps in your garden regularly, then there is a wasp nest nearby! The best advise we can give you is to sit and watch them, try to see where they are coming from and the direction that they leave in, this is where the nest will be.